Most cellular proteins are synthezised in the cytosol as preproteins and guided post- or co-translationally to the respective subcellular compartments. 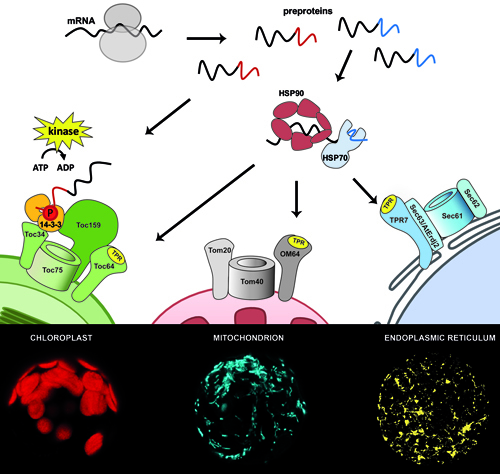 Our research is focusing on cytosolic processes involved in targeting and transport of preproteins to chloroplasts, mitochondria and the endoplasmic reticulum. The biogenesis of chloroplasts requires the massive influx of preproteins, to establish photosynthesis. Several preproteins are phosphorylated in their presequences by cytosolic STY kinases, which advantages binding of 14-3-3 proteins and elevates import efficiency. We are investigating the mode of function of STY kinases in Arabidopsis thaliana, as well as the regulatory function of preprotein phosphorylation for chloroplast biogenesis. Heat shock proteins, such as HSP90 and HSP70 are molecular chaperones, which play an essential role in preventing protein aggregation and misfolding. HSP90-preprotein complexes interact with a number of co-chaperones until they interact with docking proteins at the mitochondrial and chloroplast surfaces, from where they are transferred to the import apparatus. Our research is focusing on the interaction of preproteins with the HSP90 chaperone machinerie and docking proteins. TPR docking proteins are found in all organisms and mediate a first contact between preproteins/preprotein chaperone complexes and the import apparatus. Additionally to Toc64 (chloroplast) and OM64 (mitochondria) we have identified TPR7 as a TPR docking protein in the endoplasmic reticulum in plants. We are analyzing the role of these docking proteins in post-translational protein import not only on a functional but also on a structural level.